On the Main Line: Shadal series #2 - On Hirsch's 19 Letters and a controversy about the meaning of it's Hebrew title. Shadal series #2 - On Hirsch's 19 Letters and a controversy about the meaning of it's Hebrew title. The reason why I point this out is because in two prominent places scholars who knew a great deal about Hirsch severely criticized a third author, who wrote a book about Hirsch, for not only thinking it meant "Letters from the North," but even claimed that Hirsch consciously meant to parallel the Rambam's Iggeret Teiman, or "Letter to Yemen," since תימן, teiman also means "South" in Hebrew. First of all, what's the hava amina, why would someone think it meant North in the first place? Tzafon is a far more common word than tzafun; in fact, most people would assume the primary meaning of צפון is North. Secondly, "North" makes sense because of the geographical origin of these letters by a young rabbi in Germany (in Norddeutschland, no less). 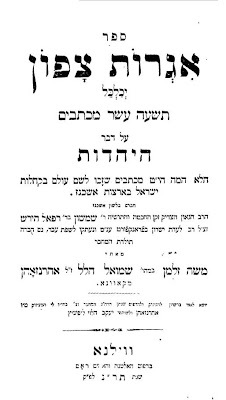 This edition, translated by Rabbi Moshe Zalman Aaronsohn, contains an approbation by R. Yitzchak Elchanan who writes that he himself encouraged the author to make this translation while Hirsch was yet alive. He writes that Aaronsohn has a letter from him to that effect. In 1976 Rabbi Noah H. Rosenbloom published his book Tradition in an Age of Reform: the Religious Philosophy of Samson Raphael Hirsch. In a 1o-page review in Tradition, Mordechai Breuer (the eminent historian, not the Masorete) fiercely criticizes the book (and, truth to be told, the author). Breuer, who happened to be a great-grandson of R. Hirsch himself, was qualified to write such a critical review. In addition to being an accomplished historian, he was an expert in German Jewry and Hirsch. I am not, but I decided to focus on one narrow point of his harsh review. Hirsch, Rosenbloom reveals to us, was driven by an unquenchable ambition to emulate Maimonides, to assume Maimonides's mantle, to become the Maimonides of the modern era (pp. 126, 398). What are the facts underlying this psychoanalysis? Hirsch consciously or subconsciously selected titles and pen names that cannot be explained unless we presuppose this innermost desire to become a second Maimonides. To take only one example out of many: "The Hebrew title of Hirsch's . . . Nineteen Letters . . . - Igrot Tzafon (Letters to the North) - parallels Maimonides's Iggeret Teman (Letter to the South). It suggests that Ben Uziel - Hirsch's pen name - hoped to resolve the religious dilemma for the Jews of the North, a euphemism for Germany in Haskalah literature, just as Ben Maimon - Maimonides - had helped to solve the religious problem of the Jews of the South approximately seven centuries earlier" (p. 125). Very good! Only that there is one little mishap, caused by the annoying habit of Hirsch's to omit supplying vowel points for his Hebrew titles. Hirsch never called his book Igrot Tzafon but Igrot Tzafun (Letters of the Concealed One, i.e., one who conceals his name),11 and it is really a pity to make Rosenbloom's psychoanalytical edifice come tumbling down over just one tiny vowel dot. It would have been pointless to dwell on Rosenbloom's jeux d'esprit at any length had he at least had the good sense to confine them to a footnote. But no! he roams on for pages, including plenty of learned notes (see especially p. 428 n. 41 ! ), with his pseudonymystic pilpul - "mountains suspended on a hair" which on closer examination turns out to be non-existent. 11. See M. Cohen, loc. cit., Hirsch's letter to Z.H. May, 8th September 1835." The loc. cit. refers to "M. Cohen, "Hundert Jahre Neunzehn Briefe," in Jahrbuch fur die Judischen Gemeinden in Schleswig Holstein, Nr. 8, 1936-37, p. 20. In other words, to know that Iggerot Tzaf_n is TzafUn you'll need to look at a letter of R. Hirsch's which was published 100 years after the book. Okay, Rosenbloom should have looked at a wider amount of literature, including this letter, but perhaps it isn't wrong to say that his error wasn't astounding, unbelievable, ridiculous. It seems like a reasonable mistake, one which in fact almost required reading the author's mind, if not his private correspondence. Naturally one wished to look up "M. Cohen, "Hundert Jahre Neunzehn Briefe," in Jahrbuch fur die Judischen Gemeinden in Schleswig Holstein, Nr. 8, 1936-37, p. 20. Strangely, the Google oracle turns up only one single result - Breuer's own review in Tradition - for the following search: "Hundert Jahre Neunzehn Briefe" +cohen. Searching for the Jahrbuch itself also reveals that it is a very obscure source. So I submit that not only before 1936-7 did most people not realize it was "Concealed," as R. Hirsch evidently said in his private letter, but even after 1936-7 most people would not have realized this, and they could be forgiven for it. In fact to me it seems that it is Breuer himself who widely disseminated the true meaning of the title. Secondly, if most people probably didn't realize the true nature of the title until 1936 (or later) then how did R. Hirsch expect people to realize it? I submit that he did not. He was therefore probably making a pun - it means both "North" AND "Concealed." I did in fact research how people understood the title before Breuer and as far as I can tell NO ONE ever understood it to mean "Concealed," which is possibly the reason why Breuer can only cite a 1936 source for it (even though it is actually an 1835 letter). That said, I do not preclude the possibility that the Hirsch family kept a tradition of what it meant and Breuer was simply citing the only thing he could cite. But if so, the alleged family tradition seems to have been unknown outside of it. The point is, it isn't as if loads of people throughout the years correctly understood it. Rosenbloom was just following the meaning that probably even Breuer himself would have subscribed to except that he had seen the obscure source (or had a tradition, which he himself did not claim). Like I said, although the letter shows that it meant "Concealed" to Hirsch, I am pretty sure it also meant "North," in which case the mountain has a resting place after all. The next source, which simply follows Breuer and acts as if of course everyone who knows anything knows that it means "Concealed," is Joseph Elias in his annotated edition of the 19 Letters. He writes that "This secretiveness about the author was underlined by the Hebrew title, Iggros Tzafun, Letters of the Concealed One - not Iggros Tzafon, Letters to the North, as misread by Professor Rosenbloom. Here, as elsewhere, he was misled by his thesis that Rabbi S.R. Hirsch was aspiring to the mantle of the Rambam and therefore wrote this work as a counterpart to the latter's Iggeres Teiman." As an aside, Dayan I. Grunfeld compares the 19 Letters to Maimonides' Guide to the Perplexed in his edition of Horeb - the same edition which Elias goes on to cite in the next few sentences. Again, perhaps Rosenbloom was not so audaciously incompetent after all. So why is this a Shadal post? Because I noticed an interesting letter in Shadal's Epistolario (his collected letters in Italian, French and Latin) all about the 19 Letters, which also assumes that it meant "Letters from the North." Writing to A. V. Randegger on January 29, 1837, Shadal writes "La da voi procuratami lettura delle letter del Nord (אגרות צפון) mi fece godere alcuni momenti deliziosissimi." In other words, Randegger had sent him some excerpts from the book, and Shadal loved it. He thought it was delicious (his words). This indicates, once again, that the average reader could be forgiven for thinking it was tzafon since even Shadal, no casual reader of Hebrew, also thought so. Again, not only was Rosenbloom perhaps making a reasonable error, he may well have even been right, if Hirsch was punning as I think he might have been. I have to say that I came across this letter well before I looked into any of the other stuff, and initially I though "Cool, even the great Shadal could make a mistake," since I "knew" that it was tzafun/ concealed. But then I began thinking, wait, how did I know that? It turned out that I knew it because it was what I had read or heard. And if you trace the source it all seems to go right back to this one letter published 100 years after the book itself was published and Breuer's publicizing the letter in Tradition in 1977. That said, I will acknowledge that it was after all possible to get the meaning correctly and perhaps some did. But if so, it seems that no one pointed it out. 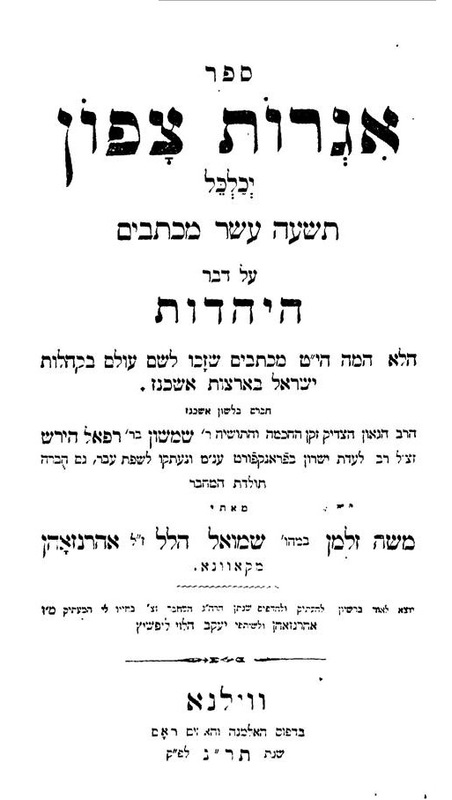 In fact in 1927 another person published a book in Satmar with almost the same name, and it seems that he must have meant "concealed." However he was not anonymous (don't be misled by "Ish Yehudi" on the title page - link). Now this noble pride, which no Jew feels any more--or if he feels it he tries to hide it so as not to be derided for it and shamed by all--the author of the Letters of the North dares to feel it and dares to make a public profession of it. In my eyes this makes him supremely worthy of being loved and admired; that is, he is supremely loved and admired by me. If I could believe that these letters could make an equal or similar lasting impression on the souls of a good number of contemporaries, and especially young people . . . I would content myself with this deserved tribute of praise . . . But finding the author's principles too incompatible with the spirit of the age to be able to hope for any influence by them on the thought and actions of our contemporaries, I will make no scruple of telling you, since you have asked me, what I think of those principles. The fundamental principles of the Letters of the North are two: one concerns the destiny of Man, the other, that of the Israelite. Hirsch says the destiny of man is to serve God, but very few actually do. This would seem to indicate a failing on God's part. But even assuming that serving God is merely a high goal that relatively few attain, what does it actually mean? God does not need us to serve him. If it means to obey God, every individual will think that he is obeying God merely by being true to one's own nature and personality [a very 21st century attitude!]. If it means specifically to obey God's revealed commandments, Shadal agrees that this is a worthy goal, but since Revelation is not a natural phenomenon but a supernatural one, we can't speak of man's "natural" destiny to serve God. Besides, such Revelation is not recognized or believed in by everyone, so obedience to it can't be regarded as a universal goal. Shadal goes on to say that he will reserve his thoughts about the "destiny of the Israelite" for another letter (but I wonder if he ever wrote it). Dan concluded by pointing out to me that "It seems a little odd to me that Shadal chose to harp on one point (correctly or not) when there is so much more to speak about in the Nineteen Letters. But as we know, he liked to call them as he saw them, and if that's what he felt was most important, so be it." This 1849 letter is not that remarkable, for it is merely a recommendation for his close student L. E. Igel. Igel was a native Galician. Here's an interesting letter by Igel regarding the Italian method of learning (link). Also, see pp. 52b -53a of Lev Ha-ivri about Rabbi Meir Ash's letter severely criticizing the Padua Seminary and Igel's יובל שי in particular. It does not surprise me that Breuer would attack Rosenbloom. In fact, the Breuer family is rumored to have attempted to supress the book because it punctures certain points of the Hirsch mythology. Rosenbloom demonstrates that Hirsch (unlike his son-in-law) was no Charedi. It appears that the family goes to great lengths to rewrite Hirsch in the Breuer image. Thanks! I was half-worried that it was ridiculous. Anonymous, I don't see why Breuer should have objected to the portrayal of him as "no Chareidi," (which I think may have been a little bit of an anachronism for 1976). I guess you mean the idea that he stood further outside of tradition than the Breuers were comfortable with? 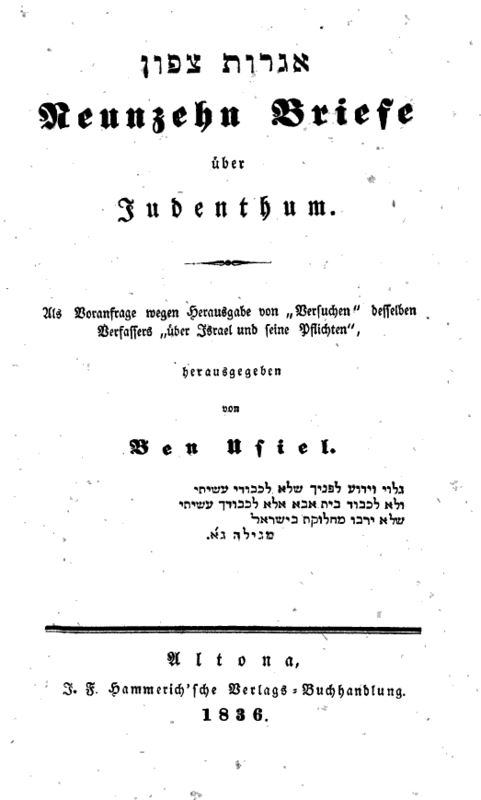 People notice that Rabbiner Hirsch punned about Iggeraus Tzofaun and Tzofun in his epochal work, but people don't understand that in the title Neunzehn Briefe über Judenthum, he alludes to his concept of German Judaism, or, Überjudenthum. Cute - or shall I say, niedlich. There's an extra apostrophe in the post's title. Just thought you'd want to know. Rab Breuer's comment about the dot reminds me of a story of the Chafetz Chaim at age 6 year in cheder. According to the story, one of the talmidim recited the opening of the Torah - breishis bara ... Hashem". When his rebbe demanded an explanation, the talmid said that there are 2 "yiddin" to which the young Chafetz Chaim explained - when the yiddin are next to each other it's Hashem, but when they're on top of one another its sof posuk. What does the letter say, in which Hirsch says the meaning is "concealed"? Unless the letter is extremely emphatic, it seems highly probable that Hirsch meant both meanings, exactly as you suggest. He had to have known people would read both meanings into the book, after all, they are both equally plausible. Really amazing post. The 19 Letter was originally written as a "teaser" for Chorev and the never published Moriah. I always thought that "tzafun" was a reference to the fact that much of the seeds of Chorev were hidden in the 19 Letters. Rav Hirsch also had his charedi side. Or have we forgotten his attacks on the Hildersheimer Seminary? I love Rav Hirsch, but I'm not so certain he was less charedi than many of his descendants -- like Isaac Breuer, for example, over whose desk hung a portrait of Kant. In a sense remaining Orthodox altogether was an act of "Chareidism" in Germany in the 19th century. Maybe Hirsch attacked the Hildesheimer Seminary, but Hildesheimer (also) attacked Frankel, and to a lot of contemporaries Frankel was Orthodox, although maybe not looking at it in hindsight. (Pretty sad if we're using attacks on the left as a measure of being Chareidi.) What makes it interesting is that nearly all those who remained Orthodox did not eschew secular culture; in fact, they all had changed their language, clothes and dress. Bravo, amico mio, molte grazie! I'm still not convinced that Shadal was reacting only to "excerpts" of the Letters. He thanks his friend Randegger for procuring him a "lettura" of the Letters, meaning a "reading" of them, which may well mean that Randegger had sent him the whole book. He could have; Shadal's letter is dated Jan. 29, 1837, and the book was printed in 1836. While it may be true that some elements of the Breuer family go "to great lengths to rewrite Hirsch in the Breuer image," the family is not monolithic, and I doubt that Mordechai Breuer had such an agenda. His harsh critique of Rosenbloom's book does not seem to be based on an attempt to paint Hirsch as a Charedi. Dan, could be. I'm just saying how I understand it. Doesn't it seem a strange way of putting it if Randegger had sent him the book? Could be he only skimmed it, thus he referred to it as "lettura." As for the whole Breuer-Hirsch thing, I think the use of the term "Chareidi" is unhelpful (and anachronistic, as I said above). With the caveat that I know nothing about this, it seems to me that it makes some sense that the Breuer family would be concerned that he always would keep his reputation as one of the gedolei yisrael, which entails portraying him less as a moderate reformer (or early experimenter, if you like) influenced by Kant and Hegel, and more as a zealous fighter for and promoter of Torah, who repaired the breeches. In fact both are true, but given the way things are, most people can't digest this. Since the paramount concern is that he remain a godol, perhaps this is why a book such as Rosenbloom's would be seen as so threatening to that image. The majority of Rav Hirsch's writings are devoted to attacking Reform Judaism and glorifying TIDE Judaism. It happens to be that we know that he instituted a choir in his shul, wore Christian-like clerical clothing, and abolished Kol Nidrei one year, but he didn't really write articles about these type of activities. It seems clear, therefore, where Rav Hirsch's heart lay. The fact that he was influenced by his time is a no-brainer to everyone except Rabbi Elias. (Rav Hirsch's views on the spirit of language, for example, were almost certainly influenced by Herder.) But Rav Hirsch would argue that the values he accepted from his surroundings were in fact Torah values. My other point is that Rav Hirsch was not an open tolerant liberal. It is clear from his writings that he was very much a fiery zealot at times. I think it's important to note this. I don't care if we call this charedi or not, but it should be noted. In hachi nami. But the material is there in his biography to set him apart from the more usual gadol be-yisrael davka at this crucial time in the transition toward modernity. His flirtation with Reform was early, but so was Frankel's. While TIDE Judaism was not Reform Judaism, it also was not Orthodox or traditional Judaism pre- emancipation, and many of the models of the most recent gedolim were from those parts of Europe were TIDE was resisted. No wonder people see the idea of a great rabbi in that light. Also, zealotry isn't exclusively a sign of Orthodoxy. Isaac Mayer Wise was a zealous Reformer. Many very Orthodox rabbis were not zealous at all. I don't really disagree with anything you said, but I just want to note that the material is there to set him apart and make him look less great in the eyes of much of Orthodoxy, as it developed. (Try explaining the "take off your hat" teshuva in Melamed Le-hoil to someone who is unprepared for the complexities of the world.) Perhaps the Breuers are/ were sensitive about this, if it's true what people say). I could probably have saved a lot of words and simply said that to a lot of people it is absurd to say that a godol was influenced by Herder. So that needs to get played down for those people. You and I may say that's simplistic, but if history gets a vote, who does the voting but the masses? And Rosenbloom obviously read his writings, mistakes notwithstanding. I basically agree with everything you wrote, although I wouldn't use the phrase "flirtation with Reform" with a capital "r."
Also, my comment about people not reading Rav Hirsch was not directed at Rosenbloom (whose book I have not yet read), but at charedim who treat him as a hero but who would probably feel a bit uncomfortable with him if they actually read him -- which was precisely your point. In 19 Letters, RSRH writes negatively about the Rambam's philosophy. I therefore would have considered Rosenbloom's analysis a stretch -- why would he compare his work to something he considered a failure? Rosenbloom's book provides many informative footnotes that are completely brushed aside, and whitewashed in the Artscroll biography. You would never realize that RSRH was sent to public school by his parents even though his own grandfather faounded a cheder in his city without reading Rosenbloom's book. In addition, the Artscroll book makes it seem as if RSRH studied in yeshivos for many years. Rosenbloom shows us that RSRH learned by the Aruch L'Ner's yeshiva for about 18 months, and after that they kept in touch mostly by correspondence. In addition, Rosenbloom's book cites the exact complaints RSRH received before he came to Frankfurt. Facts that the Artscroll biography conveniently changes to their liking. RSRH is my lifelong hero, but please, let me know the truth about him!!! To respond to Micha Berger last point, even though RSRH was critical of Rambam, it's completely palatable that he understood his historic parallel role. "In 19 Letters, RSRH writes negatively about the Rambam's philosophy. I therefore would have considered Rosenbloom's analysis a stretch -- why would he compare his work to something he considered a failure?" Who said Hirsch considered the Epistle to Yemen a failure? Or everything about the Rambam, besides for that which he criticized? That would be a stretch. I agree that Rosenbloom's thesis is built on speculative, thin reeds. But you can't knock it over with such a kasha, in my opinion. I'm not saying I agree with the thesis, but why shouldn't R. Hirsch have thought "Rambam made this and that mistake, I am called to fulfill his role in my generation without repeating those mistakes?" I just don't see the contradiction. As they say, Rosenbloom also knew that R. Hirsch had criticized the Rambam. The Artscroll book is without a doubt the best biography they have ever done. It is polemical and there are some things I can quibble with (e.g., it justifies his ostensible excuse for publishing the 19 Letters anonymously in a very lame way, and doesn't attempt to compare and contrast it with Hirsch's later comments about anonymity; another example is its non-treatment about Kol Nidre, kind of just slipping it in, hoping the reader doesn't realize that R. Hirsch was experimenting with moderate liturgical Reform). But it is in many ways invaluable, mostly because of the references. I think it's a good idea to read both books. But I never said the Igeres Teiman was a failure. Rather, that it reflects the same Maimonidian philosophy that RSRH considered overly Aristotilian, overly focused on yedi'ah and Active Intellect. Second, the Igeres Teiman is totally unlike the 19 Letters in function, as is Horeb totally unlike the Yad. For that matter 19 Letters is in part an introduction to Horeb (the other part being an introduction to the never-written Moriah). The works don't even play the same roles in the authors' repective oeuvres. I say read it with a chunk of salt. a) If it meant concealed, why wouldn't it be צפונות? b) The Breuer family is far from monolithic. Neither Prof. Mordechai (of the Tradition article) nor his first cousin Rav Mordechai would be considered Haredi. And in fact, I recently read a fascinating article by Rav Mordechai criticizing the approach of Dr. Yitzchak (his uncle) and by extension Rav Hirsch (his great-grandfather). Receiving in shape doesn't really need to become a terribly tricky process. Despite the fact that a pain to assemble and move, it's a high-quality device which offers a great benefit at under $3,000.